MS Excel will be a formidable opponent to defeat in the world of reporting. Business Intelligence has always been an important initiative for any organization. Getting the right reports for the various stakeholders has been a challenging task and not always been easy. Today there are many choices for a reporting tool. Qlickview, SAP BI/BW, Oracle, BO, Tableau etc. are some of the popular vendors. However my experience tells me that the most popular reporting tools ever used and will continue to be used for some time is Microsoft Excel. Purists may argue that it is not a BI or reporting tool however the ground reality is that is continues to be the most sought after by the business users. Moving business users out of Microsoft Excel to any other reporting tool have been a big challenge for any organization. Most of the change management initiatives have failed to glean away users from excel. This tool in spite of being incredibly simple can still handle about 80% of the reporting requirement of an end user. 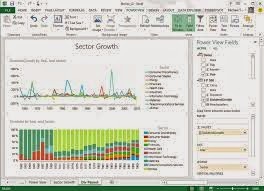 Empower End users: MS Excel gives enormous power to the end users to play around with data and produce reports according to his own convenience without much knowledge of programming. Easy access and early exposure: Most users have easy access to MS Excel. They also learn to use the same early on in life. Now MS providing MS office on cloud and also giving it free for android and apple devices would ensure the Excel remains a powerful so some time to come.